I recently got a mysterious Jasmine Cup and thought I'd post some photos and details about it. First, though, I have to say that I had a terrible swapping experience with the only person I know who resells Jasmine Cups (user Jolly Lemon, who posts on MC Sales) and strongly recommend against buying from or swapping with her. She sent it in a flat rate Express Mail padded envelope (postage $18.95), but only paid media mail postage on it, so when it arrived, the post office demanded that I pay the balance ($16) before releasing the parcel to me. She offered to refund me half, then said she had no money to pay even that, so now I am wrangling with the post office to get a refund. It's made out of frosted silicone with a slight blue tint, and has two small holes (not angled), circular grip rings around the base, measuring lines at 7.5 and 15ml on the inside, and a double rim. 'Jasmine Cup' and 'Made in Canada' are written in small, raised letters on the inside rim. The bag is green cotton with the Jasmine flower and name printed on it, and almost too small for the cup. I'm not too thrilled with the quality of the Jasmine Cup. The holes were not completely perforated, the seams where the two halves of the mold met are fairly sharp, and there's a rough spot on the cup where the mold was worn or something else was going on. Still, nothing that can't be fixed. I was curious, so I tried the Jasmine on a dry run. It is harder for me to pop open because the holes are so small and the cup is so long that my usual tricks for getting my shorter cups to pop open didn't work as well. After I got it in, I realized that I probably didn't need such a long cup. If I wanted to use it as my primary cup, I would trim the stem by at least one notch. However, if the Diva tends to pull a disappearing trick on you, the longer stem of the Jasmine might be perfect for you. If there's anything else you want to know about the Jasmine, let me know! Edited to place photos behind a cut. Also, mods, can you add a Jasmine Cup tag? Here's a link to a previous poster's entry with the large Jasmine cup (47mm by 82mm, according to the poster's measurements). While I'm not sure about the holes, the seam on my own cup does seem a bit rough, and the stem is kind of perma-bent. Not bent as much as it leans, though. Packaging details are the same (directions, box, bag). I have yet to try mine but plan on leaving a review myself. Don't mind the cloth pictures-- I was uploading all the pictures of my "new" items I had gotten in one day! I would also like a Jasmine Cup tag added to see what (if anything) anyone has to say about it (for the little that exists). I'm also up for questions! My stem leans, too. I've been trying to correct it, but it just wants to kinda hang left. Probably a result of how it was packaged. Great infos about the Jasmine, thanks! Green Donna, FreeSiya, Natural Mamma, MamiCup, OrganiCup, LilyCup, FemmyCycle, LilacCup, LunaCup, SckoonCup (unfortunately, the site is off right now), Jasmine etc. Yeah, there are a whole bunch of new cups! I hope this means that they are getting more culturally acceptable and mainstream. I was browsing eBay the other day and saw another Chinese knock-off that looks like a Lunette with a Natural Mamma stem: http://www.ebay.com/itm/Lady-cup-REUSABLE-MENSTRUAL-CUP-SIZE-L-large-BRAND-NEW-Hygienic-Free-Shipping-/261156261774?_trksid=p5197.m1992&_trkparms=aid%3D111000%26algo%3DREC.CURRENT%26ao%3D1%26asc%3D14%26meid%3D5080112448708119094%26pid%3D100015%26prg%3D1006%26rk%3D1%26sd%3D261156261774%26 . I think I probably have enough cups, though. Pretty good range of sizes and shapes; getting any more would be borderline obsessive! Interesting design. Or rather, combination of designs. "Free, Easy and Comfortable! Every Lady deserve it." Oh-oh, really, yet another knock-off ? Hmm, here's another link to a less country-specific site. http://www.aliexpress.com/item/Good-help-for-body-for-ladies-menstrual-cup-Medical-silicone-hygiene-cup-soft-cup-NEW/720529392.html If you still can't see it, I can post a pic. Looks like a Lunette body with a Natural Mamma oval tab stem. Oh this cup is basically a Lunette body and a NaturalMamma stem. interesting. Mine only has two holes, but it does have that 'worn' spot that looks like someone peeled old tape off of. That leany stem is a bugger though! Mine came from the UK via Ebay though, if anyone is wondering if there is a 'difference'. I just linked to your original post on the Jasmine Cup. I looked at it a lot when I was trying to decide whether I wanted one! Yours has only two holes? That's weird...maybe they changed designs at some point. Everyone so far has had a stem that leans to the side. I don't think it's a design feature, just a result of putting such a long cup in a relatively small box. I'm trying to fix mine, but it keeps reverting! yep, only two holes. Very strange. The one listed on Amazon also leans I just noticed. I try to arrange the stem so it is..um..facing backwards (does that sound right?) or..at least, not into my labia, which seems to help. I'll try it inside out again before lopping the stem off. Just for curiosities sake which way does your stem lean? mine is towards the ml/made in Canada side. I could have sworn mine had four holes, but you're right...there are only two! My stem leans towards the Jasmine text side. I'm split on the knockoffs, too. 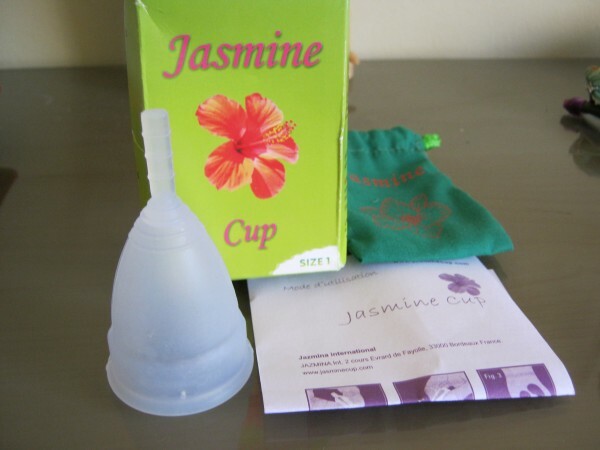 I mean, it sounds like the Diva with a longer stem would be perfect for some people, but it's not an option Diva Cup offers, so I could see why even someone who wanted to support Diva Cup would go for a knock-off Jasmine. If some one came up with a knockoff of LadyCup with real grips and no weird lower holes that reduce capacity, I'd probably be all over that. 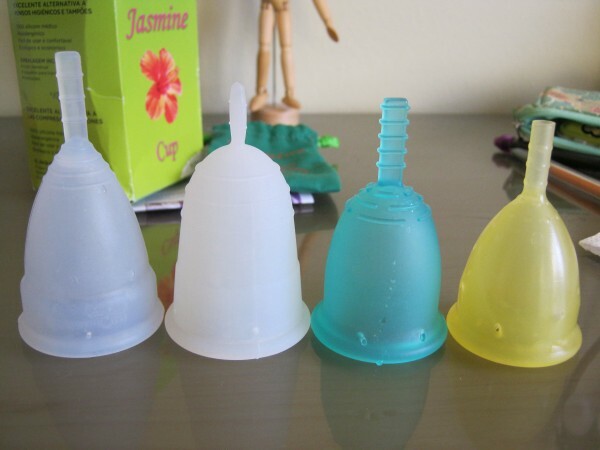 I am also hopeful that more knockoffs = menstrual cups are gaining popularity and marketshare. I kinda keep expecting to see one show up at my local Daiso (Japanese $1.50 store)! Since I think cups do a good job of reducing waste, even if you get a couple of them (guilty...), I'd like to see more availability. Lots of Canada speaks french so it's not surprising that it's in french. Unless it does actually seems to be based there too like you say. I need something longer than my small lunette (which including the stem is quite long). Do we know knockoff cups are safe? How annoying is the leaning? Aren't you guys at all worried about the material of cheaper cups? I would never put anything inside my body that I was not sure that it doesn't contain anything dangerous (BPA, softeners etc). I believe the risk of the materials in these cups is really worrying. Also there is the issue of cheaper cups being produced far away with no control over ethical conditions of workers etc. If the company/website etc is not traceable I would not trust the product. www.greenapplecup.com/3-jasmine-cup.htmlTalla1: Si eres menor de treinta años, tienes reglas poco abundantes y no has tenido hijos/as por parto natural, esta es tu Jasmine cup Talla 2: Si tienes más de ..."
But then when trying to go on it, I'm said = "2012 Copyright. All Rights Reserved.